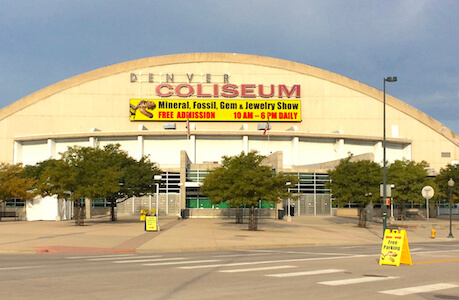 The 2017 Denver Coliseum Show will expand into the adjacent National Western Complex, totaling over 400,000 sq. feet. This expansion will more than double the size of the show. There will be 400+ dealers on both Coliseum levels + all 3 National Western Complex levels + tents next to both buildings. It's not just more dealers. Because those dealers will now have larger booths, there will be far more inventory for you to peruse than you'd expect from "just" 400 dealers. The show promoters invite you to join 40,000 visitors who will explore more than 5 miles of tables of minerals, fossils, gemstones, cabochons, artisan & antique jewelry, beads, crystals, meteorites, metaphysical, gold, silver, Native American items, interior decor, metal art, miner's rough, tools, supplies, and so MUCH more.